The interior leans towards quirkiness dressed in 50’s décor, rickety mismatched furniture and collectables. 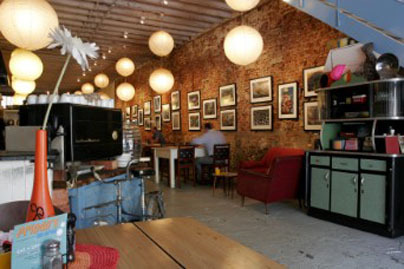 The menu proffers urban home-style food such as generous salads of rocket and Parmesan topped with springbok Carpaccio, Cape Malay chicken wraps filled with fruity, tomatoes, spicy curry, sweet potato and coriander soup or crumpets with bacon and maple syrup. 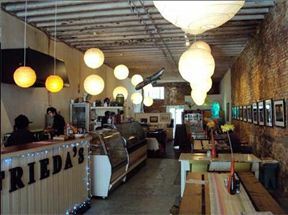 Enjoy a retro hip atmosphere over breakfast, lunch or dinner at this quirky little eatery on Bree Street. +27 (0) 21 421 2404? 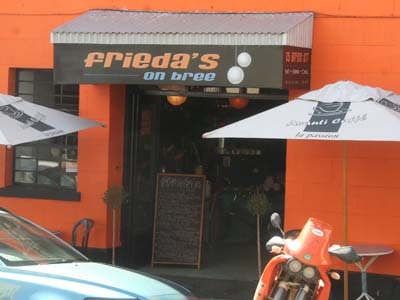 Frieda's on Bree is 1km from the centre of Cape Town , the nearest airport 20.4km (Cape Town International Airport).